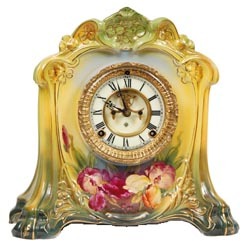 Ansonia Clock Co., Royal Bonn, "LaCette", ca 1904. This is a very stylish and colorful case that is 12" high and 12" wide. The color that stands out is the yellow although green is probably the primary color. The base isdark green, becoming lighter green as you reach the top. The flowers are yellowand red. It has the usual gold highlights placed strategically to outlinecertain features. Ly-Ansonia No. 2586.